In May, 2016 Secure Futures LLC completed a solar power generation system on the campus of the University of Richmond (UR) in Richmond, Virginia. 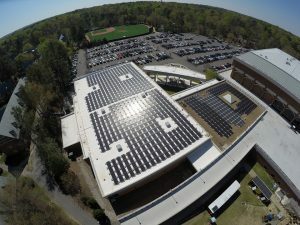 Totaling 205 kW, the array was installed on the roof of the Weinstein Recreation and Wellness Center. The UR project is home to the first commercial application of SolarWorld USA bi-sun solar panels, which increase efficiency by taking advantage of solar radiation from both direct sunlight on the front and ambient light from the back. Employing various roof and solar panel types, the array was designed to be a research and development tool for both UR students and faculty and SolarWorld Americas Inc. The project was also the first commercial-scale power purchase agreement (PPA) in the state of Virginia since a pilot program in Dominion Virginia Power’s territory began in 2013. Secure Futures LLC, through a project company of local investor, Richmond Solar, LLC, purchased and owns the solar panels on the UR campus. UR hosts the solar facility, and buys electricity generated from the panels at a predetermined price through a power purchase agreement. The project was financed by sponsorship equity from SolarWorld Americas Inc. and an individual, a bridge loan from Virginia Community Capital, and permanent financing from M&T Bank. Learn more about Clean Energy Lending.